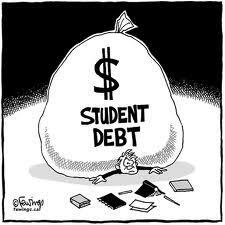 Easy Way To Pay Back Student Loans: Don't! The Federal Reserve Bank announced that Americans over age 60 currently owe more than $36 billion in unpaid student loans. - Not suprisingly, none of them did very well in the “Economics” class they took, back when they were taking out the loans. - Will they pay them back? At their age, I’d say that really Depends.